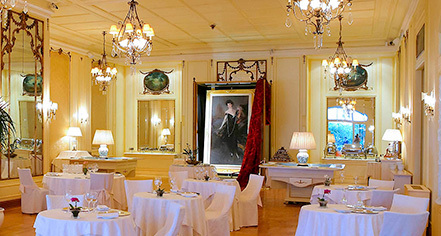 Guests will have the option of dining at two restaurants during a stay at the Grand Hotel Villa Igiea Palermo - MGallery by Sofitel, each with its own authentic Mediterranean specialties - the fine dining Cuvée Du Jour and the Donna Franca Florio with its terrace. The hotel also features a poolside bar that is open during the summertime and set inside the magical hotel gardens. Cuvée Du Jour gives guests a taste of the highest quality ingredients while dining at this exclusive and refined gourmet establishment. Chef Carmelo Trentacosti has designed tasting menus that are sure to provide an unmatched culinary experience for guests visiting the island of Sicily. 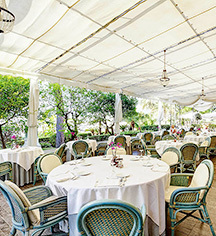 Tuesday - Sunday, 8:00 p.m. - 10:30 p.m.
Donna Franca Florio has a terrace which overlooks the sea, where up to 150 guests can enjoy seasonal dishes with flavors typical of Palermo. Sip on cocktails in the unique atmosphere of the terrace or under the vaults at Bar Des Arcades. April to October: Monday - Sunday, 7:30 p.m. - 10:30 p.m.
November to March: Monday - Sunday, 12:30 p.m. - 3:00 p.m.
November to March: Monday - Sunday, 7:30 p.m. - 10:30 p.m. Guests ravenous after a few laps in the pool or lounging in the sun can visit the Pool & Grill Bar, open only in the summertime. Serving up barbeque, a delectable buffet, and craft drinks the restaurant and bar is perfect for an afternoon snack or informal lunch. April to October: Monday - Sunday, 10:00 a.m. - 7:00 p.m.
Des Arcades lounge and bar offers an unforgettable atmosphere with a terrace overlooking the marina bay. Guests can sip cocktails by the fireplace in the winter months or a delicious cappuccino on the sunny sea-view terrace when weather permits. The lounge and bar serves cocktails and snacks, with live piano every evening. April to October: Monday - Sunday, 5:00 p.m. - 1:00 a.m.